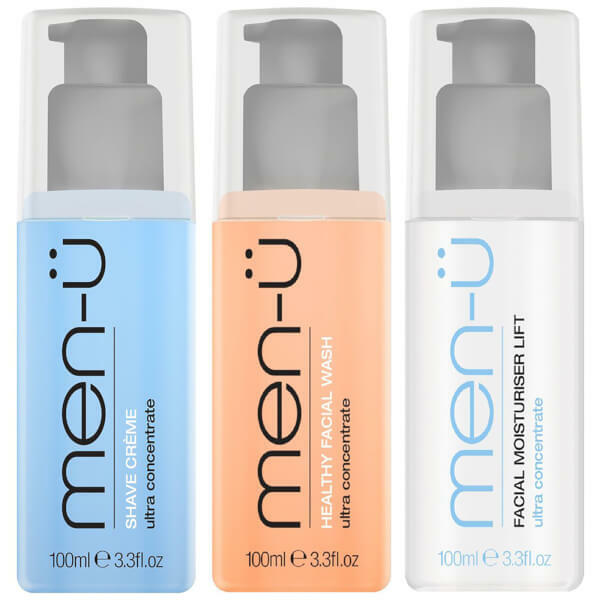 The men-ü Shave Facial Trio combines a selection of grooming products to ensure skin is left feeling clean, supple and fresh. Specifically developed for tackling men’s unique skincare attributes, the treatments work in synergy to promote a smoother shave and revitalised skin. 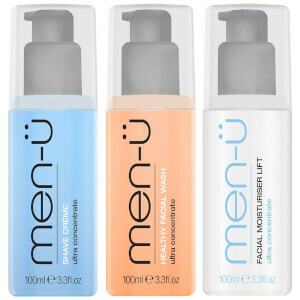 The Healthy Facial Wash is ideal for using pre and post shave. Its unique, soap-free formula deeply cleanses skin and contains powerful ingredients, including antiseptic Tea Tree Oil to protect from breakouts and shaving rashes. Soothing Witch Hazel helps heals skin and control grease, especially around the T-zone, whilst Aloe Vera and Vitamin B5 moisturise skin to leave it hydrated and healthy-looking. Facial Moisturiser Lift Tube is a two-in-one aftershave balm and moisturiser to relieve redness. The non-greasy treatment soothes and smoothens skin, leaving it with a cooling mint and menthol fragrance. Facial Wash: Aqua, Glycerin, Sodium Laureth Sulfate, Cocamidopropyl Betaine, Peg-7 Glyceryl Cocoate, Peg-12 Dimethicone, Melaleuca Alternifolia (Tea Tree) Leaf Oil, Acrylates/C10-30 Alkyl Acrylate Crosspolymer, Mentha Piperita Leaf Extract, Xanthan Gum, Panthenol, Propylene Glycol, Hamamelis Virginiana Bark/Leaf/Twig Extract, Sodium Pca, Sodium Lactate, Benzophenone-4, Aloe Barbadensis Leaf Juice, Disodium Edta, Sodium Hydroxide, Lactic Acid, Triethylene Glycol, Benzyl Alcohol, Limonene, Fructose, Inositol, Glycine, Urea, Niacinamide, Sodium Benzoate, Magnesium Nitrate, Methylparaben, Magnesium Chloride, Sorbic Acid, Methylchloroisothiazolinone, Methylisothiazolinone, Ci 15985, Ci 16035, Ci 42090. Shave Crème: Aqua, Palmitic Acid, Myristic Acid, Peg-8, Glycerin, Stearic Acid, Coconut Acid, Potassium Hydroxide, Triethanolamine, Sodium Lauryl Sulfate, Parfum, Phenoxyethanol, Propylene Glycol, Peg-14m, Mentha Piperita Leaf Extract, Hydroxyethylcellulose, Caprylyl Glycol, Peg-12 Dimethicone, Chlorphenesin, Lauric Acid, Melaleuca Alternifolia (Tea Tree) Leaf Oil, Limonene, Linalool, Menthol, Butylphenyl Methylpropional, Sodium Sulfate, Hexyl Cinnamal. Facial Moisturiser Lift: Aqua, Paraffinum Liquidum, Cetyl Alcohol, Glyceryl Stearate, Palmitic Acid, Glycerin, Stearic Acid, Peg-30 Stearate, Dimethicone, Phenoxyethanol, Menthyl Lactate, Ethylhexyl Palmitate, Parfum, Caprylyl Glycol, Tocopheryl Acetate, Chlorphenesin, Menthol, Xanthan Gum, Aloe Barbadensis Leaf Juice, Sodium Lactate, Citric Acid, Limonene, Linalool, Butylphenyl Methylpropional, Hexyl Cinnamal, Sodium Hydroxide, Alpha-Isomethyl Ionone, Citronellol, Potassium Sorbate, Sodium Benzoate.